Above: Three generations of women in my family. From left we are: my mother, Aliki (Hatzinikolaou), maternal grandmother, Maria (Katsakosas)and myself. Above Right: A family photograph. Standing are: myself, my brother, Mihalis and my sister, Mersini (Papantoniou). 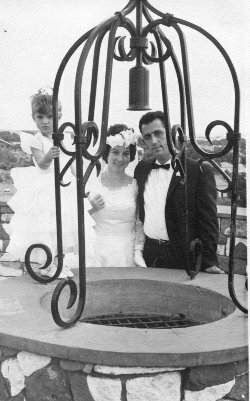 Sitting are: my mother, Aliki, my paternal grandmother, Efterpi, and my father, Paraskevas. Above: Dressed up for Apokries. Above Right: At the Festival of Agios Georgios with my friends. From left, we are: Eleni Zorbas, Marika Evangelinou, Fanoula Papantoniou, me, Rinoula Samara, Marika Skarlatou and Stratoula Papantoniou. Above: A wedding photograph with my husband, Eustratios. 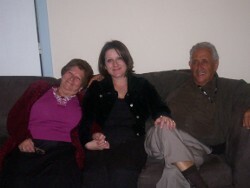 Above Right: With my husband, Eustratios, and our daughter, Aliki.